Juan Carlos Taminichi - ARTE AMAZONIA provides a global voice through art for the indigenous cultures of the Amazon. 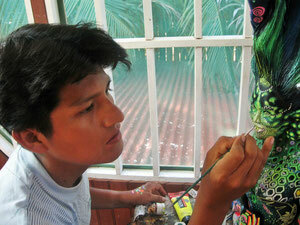 Juan Carlos is a young Taminchi artist inspired by Peruvian Andean and Amazonian cultures. At the age of 8 years, he began nature drawing openning his awareness to the world of artistic dreams. At College, he attended art education courses that gave the desire to continue his studies at the School of Arts of Pucallpa where he trained to be a teacher of Arts. 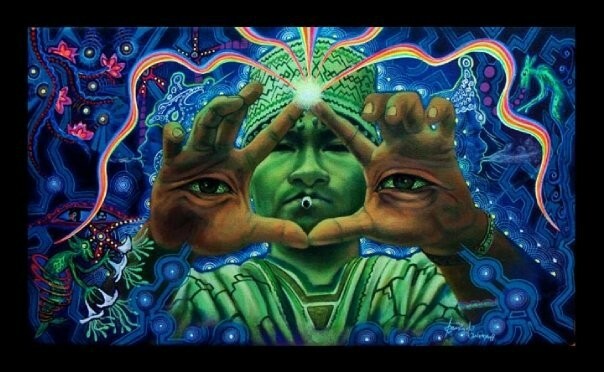 In his search for new artistic expression, he discovered the world of spirits and sacred plants that allowed him to deepen his experiences and approach to Visionary Art. He has participated in several exhibitions and various workshops sharing with other visionary artists of the region and from around the world. He participated in his first solo exhibition in October 2009 called "Amazonies" in Paris. Consequently, represented the Association of Painters and Sculptors Amazon "ONANYATI" (Wisdom of Old Masters, in Shipibo) and in the group exhibition, "Jamais trop d'Art" in Tournai, Belgium. This past year he has been busy with various exhibitions around the world including, "Third Eyes Gallery" at the 2012 Boom Festival in Portugal, "Burning Man 2012", "Matices de las Americas" “Moksha Fair Art“ in the U.S.A.
Music by UASCA " Revelation 999 ". Videos edition by Tachyon Electrik Dream PT.